Most frugal cooks save steak for a special occasion- especially the expensive cuts like NY strip or rib eye. There is a cut of beef that’s every bit as tender and flavorful as those expensive cuts but often half the price. I’m referring to the flatiron steak. If you’ve never heard of a flatiron steak, sometimes called top blade steak, don’t be surprised. 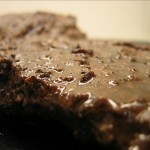 Up until the last few years, the flatiron cut was often ground into hamburger! The flatiron steak is the outcome of a 2002 University of Florida research study that analyzed hundreds of different pieces of beef looking for underappreciated parts. 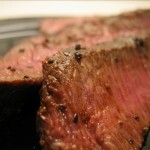 The researchers discovered the tender flatiron cut near the shoulder from where the chuck roast is cut. 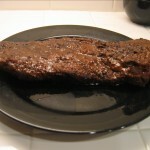 It’s fairly lean but has a rich flavor similar to sirloin or skirt steak. Restaurants started serving flatiron cuts first and it’s become more popular than t-bone and porterhouse steaks combined. The increased demand for flatiron steaks is helping them find their way into supermarket meat departments everywhere. While you’re not going to find a flatiron cheaper than chuck or hamburger, at around $5-$6/lb it’s definitely well under the high end steaks that could go for well above $10/lb at the local market. I first marinated the steak in the liquid smoke (for smokiness) and soy sauce (for saltiness). I sometimes like to use the preground black pepper because it has a different flavor than fresh ground that sometimes just works (like for making homemade jerky). After shaking off the excess liquid, I laid a hefty coating of pepper and paprika. I think coated with olive oil to keep it sticking on the grill. WIth the grill fired up to high, the flatiron spent about 5-7 min on each side until the largest end started to firm up when poked with a finger. Let rest for a few minutes and then slice at an angle to make the slices look larger. YUM! Brussels sprouts have a bad reputation for tasting icky. Well, that’s because they do taste icky when boiled until dead as do other vegetables. The problem is they are fairly tough and take a while to cook. They’re too thick to sautee from raw, so I steam them first until just tender. I then sautee them in some olive oil until they pick up a little color on the outside. A little salt and pepper and they’re finished. A little drizzle of truffle oil also goes incredibly well. You could also cut them in half before sauteeing to add some extra surface area. Another nice treatment would be to take them out of the steamer, cut in half lengthwise, toss in olive oil, salt and pepper and then roast in the oven face down on a nonstick baking sheet or some nonstick foil. 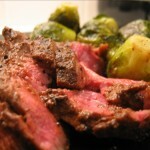 If you have any additional ideas for what to do with a flatiron steak, post a comment! I have been cooking this cut for many years as the military commissaries have carried it for a very long time. i accidently found an unconventional way to cook it as I did not know it wasn’t a tough cut. I put it in my small pressure cooker with a can of “manwich” sauce and cook for 20 minutes after the pressure gage starts to rock. 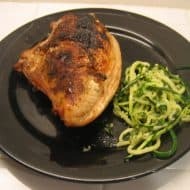 The cut has a hearty flavor that goes well with the barbeque and the pressure cooker makes it like a really tender pot roast.